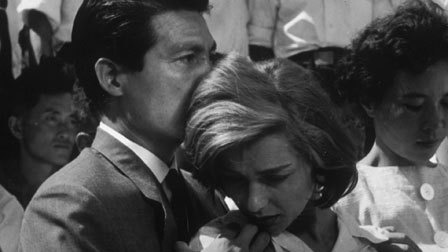 Alain Resnais' landmark debut feature “Hiroshima Mon Amour' (1959) exists at a permeable border where the past bleeds into the present, documentary intersects with fiction, and the individual blurs into the collective. An unnamed French woman (Emmanuelle Riva) travels to Hiroshima (where the hypocenter of the bomb that killed over sixty thousand has already morphed into a memorial site called Peace Square) to shoot a film. She meets an unnamed Japanese architect (Eiji Okada) and they carry on a brief, passionate affair, initially portrayed in purely physical terms as the film opens with close-ups of their intertwined bodies covered by glittering silt, but later blossoming into an even more intense form of intimacy. We don't even see either of their faces until the sixteen-minute mark when, as if a spell is broken, the film lurches firmly into both the present and the fictional as the lovers share a bed, a shower and drinks out on the town. Information is doled out slowly. After an early shot shows her wedding ring as she digs her fingers into his back, we learn that they are both married (contentedly, they claim) and also both struggling with their own traumas. Through the intricate use of flashbacks, Resnais suggests that the past (trauma) is eternally present, a defining quality of the often uncomfortably intimate (even navel-gazing) screenplay by then-established novelist and future filmmaker Marguerite Duras. While their bodies were close before, their minds (or spirits, if you prefer) mingle even closer as she unloads a lifetime of despair by revealing the tragic outcome of her teenage first love during the Occupation in Nevers, France. The knowledge that he is the first person she has ever shared her story with turns him on more than any roll in the hay. Her personal loss coincided, more or less, with the Hiroshima bombing. How can she still obsess over a doomed teenage romance (no matter how badly it ended) while visiting the site of a recent historical mass killing? The script and film suggest that the answer is simple: because she's human. Pain is subjective. Resnais used different cinematographers and different film stock to stage the flashback scenes set in France (shot by Sacha Vierny) and the contemporary scenes shot in Japan (Michio Takahashi), but the constant cutting back and forth between time frames along with her increasingly frantic voice-over merges the two into one flowing stream. These may well be the images she sees every time she closes her eyes and those memories are as much “now” to her as her affair with the architect, so much so she begins to confuse this new man with her lost lover. From her perspective, the bombing is something “they” did, not just a reference to Americans vs. French but to the “they” who were obsessed with the war while she was obsessed with “dime-store romance.” From his perspective, she is they. Summarizing the Hiroshima he assures he she knows nothing about, he says of the bombing, “The whole world rejoiced and you rejoiced with it.” Whatever meeting of the minds (and spirits) they have had, they will never be one. The film's unusual narrative structure makes it difficult to describe, but the far more challenging aspect is the intricate, affective score by Georges Delerue and Giovanni Fusco. As several commentators have noted, Resnais often sought out writers who had a musical quality and “Hiroshima Mon Amour” is inextricably linked to a score that never strikes the obvious chord, never settles for underscoring the obvious emotion. Alas, critics not trained in music simply don't know how to write about it. The film must be seen to be understood but it also must be heard. And this would be true for most of Resnais' work. The overall experience is both unnerving and unshakeable. It's also a unique experience that makes it tough, more than half a century later, to view “Hiroshima Mon Amour” as truly being part of the first batch of French New Wave films alongside Chabrol's “Le beau Serge” (1958) and Truffaut's “The 400 Blows.” Resnais, like his friend Agnès Varda (whom he helped considerably in post-production on her great 1956 debut film “La Pointe Courte”), was never quite part of the movement defined by the younger (and less broadly erudite) Truffaut, Godard and others. The only film of the time that springs to mind as being particularly similar to “Hiroshima” is Resnais' next movie, the all-time great “Last Year At Marienbad” (1961). While I prefer “Marienbad” to “Hiroshima” (and also to almost every other film ever made) there's no need to choose between the two. The one-two feature punch of “Hiroshima” and “Marienbad,” following on the heels of several of the greatest short documentaries ever made, rendered Resnais' first decade as a filmmaker one of the greatest first decades by any filmmaker. The next five decades weren't so bad either. The film is presented in its original 1.37:1 aspect ratio. 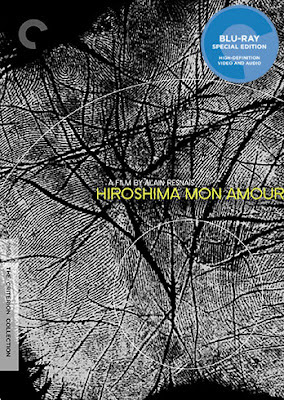 Criterion originally released “Hiroshima Mon Amour” on DVD in 2003 and I do not own that disc as a point of comparison. This Blu-ray upgrade retains the old Spine Number 196. The source for this high-def transfer is a 2013 restoration conducted at the Cineteca di Bologna lab with the collaboration of several organizations. The restoration looks pretty fantastic and the high-def transfer shows a film with rich black-and-white contrast and only a few minor instances of damage. As mentioned, the flashback sequences in France and the scenes in Japan were shot by different cinematographers and on different stock. The early portion of the movie also incorporates a lot of archival footage. The video quality obviously varies based on the source but it all looks quite spectacular when assembled here. I have no complaints about this very fine 1080p presentation. The LPCM Mono audio mix is sharp and sounds appropriately hollow/haunting at times. The score, so integral to the film, sounds quite rich and resonant. Again, no complaints. Optional English subtitles support the mostly French audio. The Criterion Collection has assembled an impressive collection of extras both old and new. The disc include two interviews with Alain Resnais. The first is from 1961, an excerpt (6 min.) from the French TV show “Cinepanorama.” Resnais just stands in front of a wall and talks and he is at his most humble and engaging, describing himself more as an editor than a director and how he feels it's important to ask viewers to “complete” films as a show of solidarity. He is, of course, correct. The second is from 1980, an excerpt (11 min.) from the French TV show “Le cinema de cineastes.” It is audio only (with a still of Resnais showing) in which he talks about the impossibility of filming the bombing of Hiroshima as a subject. He also talks about the different collaborators on the project at various times which included, briefly, Chris Marker. We also get two interviews with actress Emmanuelle Riva. A 1959 clip (5 min.) is mostly a publicity piece shot at the film's debut at the Cannes Film Festival and doesn't offer too much except the chance to see Riva in 1959. The 2003 interview (19 min. ), in which Riva was filmed by the Criterion Collection, is much more substantive. The disc also offers two new interviews. Film scholar Francois Thomas (2015, 26 min.) discusses both pre-production and shooting of “Hiroshima” in detail. This is a fine analytical piece that had me interested from start to finish. Professor Tim Page (2015, 10 min.) talks about the film score, spotlighting the contributions of both Georges Delerue and Giovanni Fusco. The final feature is a piece on the restoration of the film (11 min.) which was conducted in 2013. Davide Pozzi, director of L'immagine ritrovata (the lab where it was done) and cinematographer Renato Berta (who Resnais asked to supervise the restoration) discuss the process. I felt they both rambled off-topic for a while and little more than half of this short feature actually touches on the restoration. The insert booklet includes an essay by critic Kent Jones and excerpts from a 1959 “Cahiers du Cinema” round-table discussion about the film, including critics and soon-to-be-filmmakers Jean-Luc Godard, Jacques Rivette and Eric Rohmer among others. Alain Resnais' death last year also means that cinema is all but dead. But then cinema has always been a mausoleum, a fact few directors understood as well as Resnais, so perhaps there's nothing much to worry about. Not as long as we have perfectly-preserved releases like this available for home consumption.